If you plan to visit Kauai, I’ve created this guide to assist you with your search for gluten-free or peanut-free food with a focus on the north and east shore. Enjoy! While the state of Hawaii is a magnificent place with beautiful vistas everywhere you turn, Kauai is the crown jewel. This rural island is exquisite with its multiple waterfalls, rainbows, mountainous green landscape with red dirt, gigantic flowers and tropical plants, caves, beautiful beaches and a canyon nicknamed the Grand Canyon of the Pacific. My family fell in love with Kauai almost eight years ago. Despite a reluctance to visit the same place twice, we returned last summer and had a fabulous time. I have a strong bias regarding this island. If you visit in the summer, I think the best place to be is on the north shore. With calmer summertime surf, snorkeling and water activities are plentiful and the scenery is unparalleled! Rugged green mountains dipping into the ocean, picturesque towns, taro fields, and colorful fish and coral reefs lining the shores, it’s a feast for your senses. Yes, it can rain but with rain comes spectacular flora and frequent rainbows. While the north shore is amazing, there is much to see and do in other parts of the island as well. You won’t be disappointed! If you are living with celiac disease or a peanut allergy, there are markets and dining establishments that can meet your needs. Use my guide as a launching point for your trip and check out the links below. If you have more to add, pay it forward! Lihue is the capital city where you will land in Kauai. Nearby, you’ll find a Costco which is a great place to stock up on essentials for your condo. Beach gear that couldn’t be squeezed into your luggage can be purchased here as well. Gluten-free, peanut-free goodies made by Sweet Marie! Alternatively, you can rent masks, snorkels and fins at Jack’s Dive Locker which is right on the main road, heading north. Prices are fairly reasonable. Save that luggage space for specialty food items you’d rather not pay high Hawaii prices for! Lihue has some good restaurants and a fabulous bakery called Sweet Marie’s that is both gluten-free and peanut-free. My son was delighted! Imagine finding a place where you can eat EVERYTHING! Marie truly “gets” celiac and allergy issues and is very welcoming. My son puts up with some disappointments when we travel despite our best research: food that has to be sent back, limited options, disclaimers from staff — anxiety, not withstanding! When we can find a bakery or restaurant that completely meets his needs, we plan a day’s itinerary from it. Stock up on Sweet Marie’s baked goods here before heading to your condo! Kapa’a is a large town just north of Lihue and has some sizable supermarkets and a wide variety of restaurants. The Safeway and Foodland are fairly large and have some specialty foods. 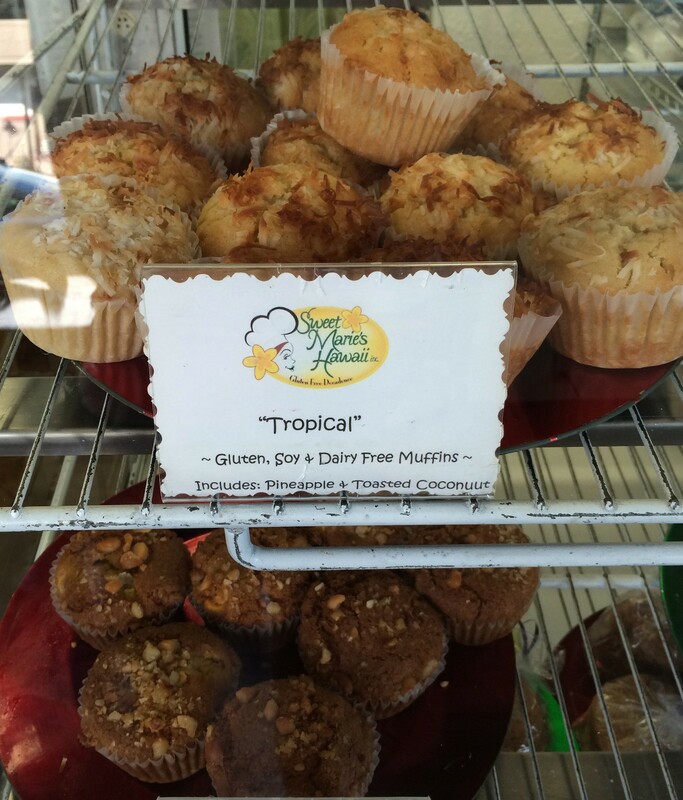 The best place for specialty items, however, is at Papaya’s Natural Foods and Cafe. They have organic produce, a small deli, a good selection of specialty food items you count on at home and a lot of local products that you wouldn’t find on the mainland. It’s definitely worth a stop. Caffe Coco features local and organic cuisine and looks like a fabulous place to eat. I spoke with the chef and he assured me that he could safely provide a gluten-free and peanut-free meal, even though peanuts are sometimes on the menu. Since we were about to board a red-eye flight back to the mainland that night, my son and I didn’t feel comfortable taking that chance. Someday, we hope to return! Reviews support that Caffe Coco is celiac and food allergy friendly so definitely check it out. Here is a list of dining options that may be viable for a gluten-free or peanut-free diet in Kapa’a. I have not dined at them but at least they are a starting point for your own research! Hukilau Lanai has a gluten-free menu, GF bread and one diner noted that it accommodated their multiple food allergies. Kauai Pasta was reviewed well and has GF options. Art Cafe Hemingway has an interesting GF menu and homemade gluten-free, dairy-free and nut-free bread. They are reportedly knowledgable about celiac disease. Chicken In A Barrel BBQ is a food stand with lots of GF menu choices. They are not exclusively GF so questions are in order. Rainbow Living Foods is completely gluten-free and features some dairy-free options as well. Gopal’s Creperie is a gluten-free and vegetarian food truck which had a lot of positive reviews. North of Kapa’a along the main road, Highway 56, you will come to Kileaua at the northern end of the island. This is a community worth visiting with its beautiful lighthouse at the Kilauea Point National Wildlife Refuge, Na Aina Kai Botanical Gardens and some interesting shops. The restaurant that we visited, called the Garden Cafe at Common Ground, is now closed so here are a few thoughts on the other dining establishments. The Kilauea Fish Market is well reviewed and may be able to handle celiac diners, per two recent reviews. Their Asian offerings such as Korean BBQ lead me to speculate that it may not be safe for the peanut-allergic diner though. The Kilauea Bakery and Paul Hana Pizza has gluten-free pizza but cross-contamination is a noted concern so celiac diners may need to look elsewhere. The Lighthouse Bistro looks like it could be a viable option for celiacs with its full GF menu with gourmet offerings. Princeville has a championship golf course that people rave about and is a mecca for condos. This in itself doesn’t charm us but as lodging goes, this is a reasonable place to stay on the north shore. The location is fabulous with loads of activities a very short drive away. There is a Foodland grocery store that has a good selection of specialty foods but not enough to skip a visit to Papaya’s in Kapa’a though. It’s pricey so try to buy more items in Kapa’a on your way to the north shore. If you’re like us and are constantly running to the store for forgotten items, you’ll be glad to have this well-stocked supermarket nearby. In Princeville, the Nanea Restaurant and Bar located in the Westin Hotel may be a good option as it has a gluten-free menu. We did not dine there. The health food store in Hanalei. 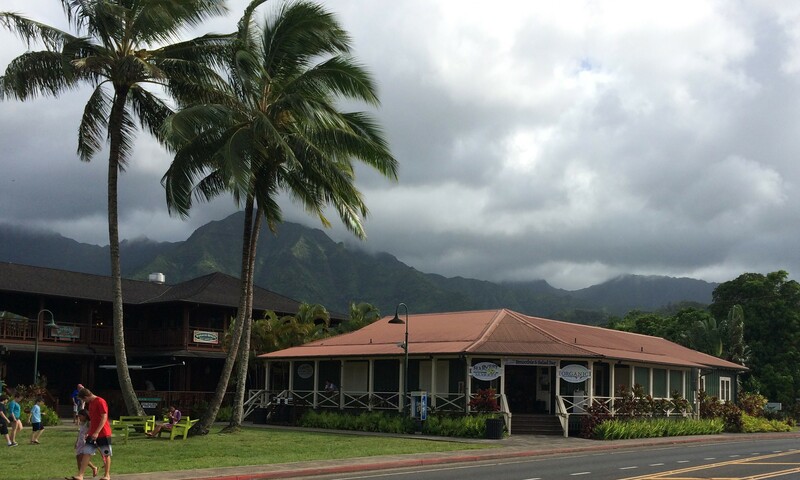 Hanalei is a spectacularly beautiful town with lots to see and do! This locale was the inspiration for Bali Hai from South Pacific. Keep driving west to the end of the road and you will come across beaches with lively coral reefs, accessible caves, botanical gardens and the infamous Na Pali Coast. 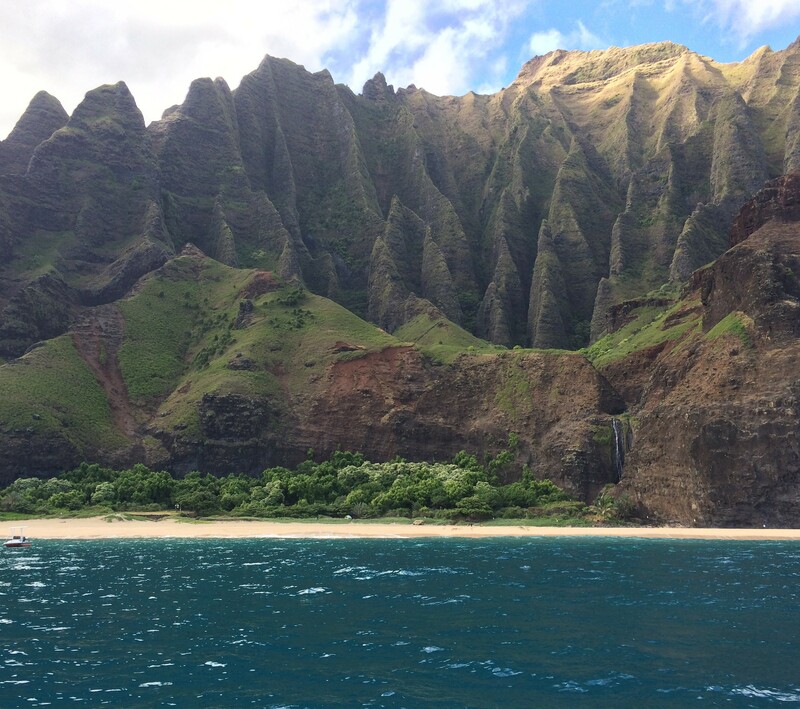 A boat ride along this coast leaving from the north shore is a must! The Kalalau Trail starts at the end of the road. We hiked a short distance on this breathtaking trail and it’s on my bucket list to go back someday and hike further. If you’re staying near Hanalei, check out the farmers’ market west of town (open Saturday mornings) for fresh Kauai-grown produce. Hanalei has a Big Save supermarket and a great health food store called The Harvest Market Hanalei. If you need specialty foods, they have a nice selection. 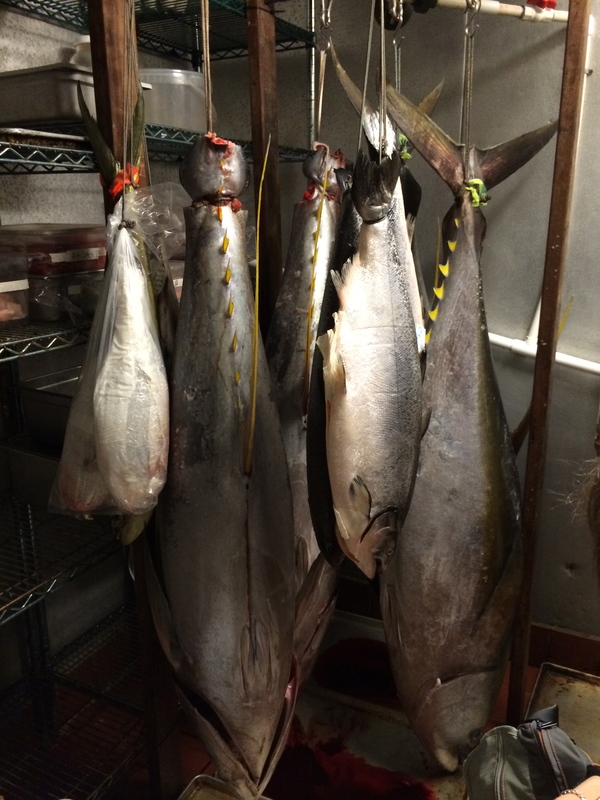 A look inside the walk-in cooler at the Hanalei Dolphin. Still hungry? If you like fish, try The Hanalei Dolphin. We bought fish from their market and they were attentive to our needs. We did not eat in the restaurant. They have an amazing selection of seafood and, per reviews, may be able to accommodate the peanut/tree nut allergic diner and those with celiac disease. 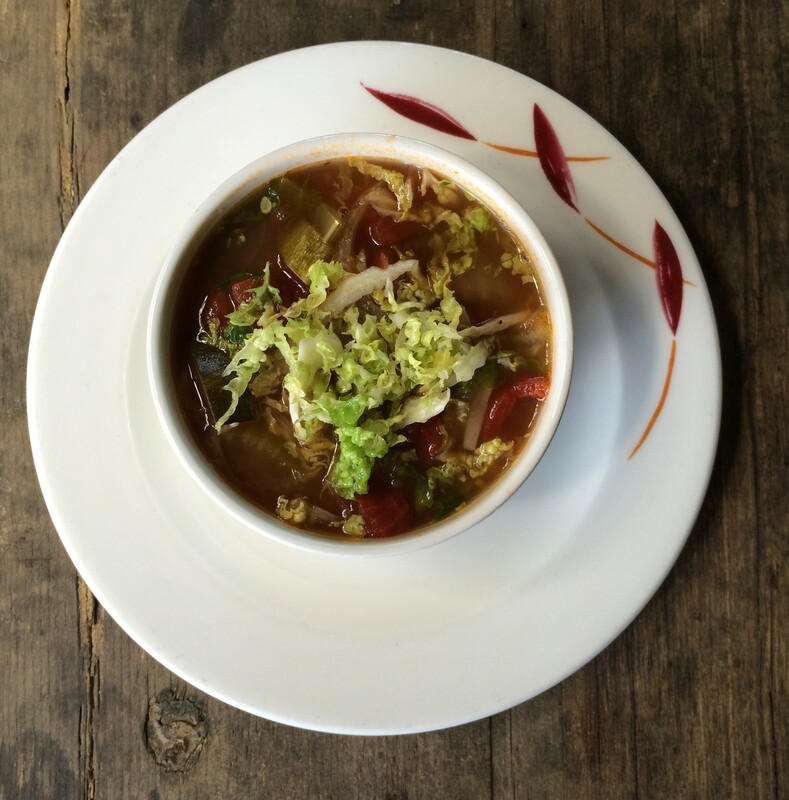 We tried a vegetarian restaurant that offered seafood as well called Postcards Cafe. Our meal was very good and the menu, which is mostly GF, was enticing. I had screened this option ahead of time and the staff assured me they could meet our needs. Peanuts aren’t on the menu. However… My son had a reaction to something hours later. We believe it was probably due to a peanut-contaminated source of seeds or tree nuts. There were plenty in the appetizer that he ordered. If I had been there at that time of ordering, I would have inquired about cross-contamination but I wasn’t. It was a good lesson in being sure that my son and other members of the family understand how to appropriately interview staff when ordering items. As a mom, “doing it all” can be a detriment! If you would like to try this restaurant, I encourage you to interview them carefully. I came across a helpful review on Tripadvisor, suggesting some Hanalei restaurants that were peanut and tree-nut allergy friendly. They include: the Hanalei Dolphin, CJ’s Steak and Seafood, Kalypso Island Bar and Grill, the Olympic Cafe and Smith’s Luau (in Kapa’a). A Luau is a must when going to Hawaii. We attended a wonderful one on the Big Island so we didn’t go to one in Kauai. If you are looking for a luau, my research turned up two great possibilities. Smith’s Family Luau in Kapa’a looks terrific. I’ve seen enough reviews to conclude that they can manage celiac and peanut-allergic diners quite well. If you are staying at the south end of Kauai, the Sheraton Hotel in Poipu has a luau with a special allergen menu, which makes this a very encouraging option as well. 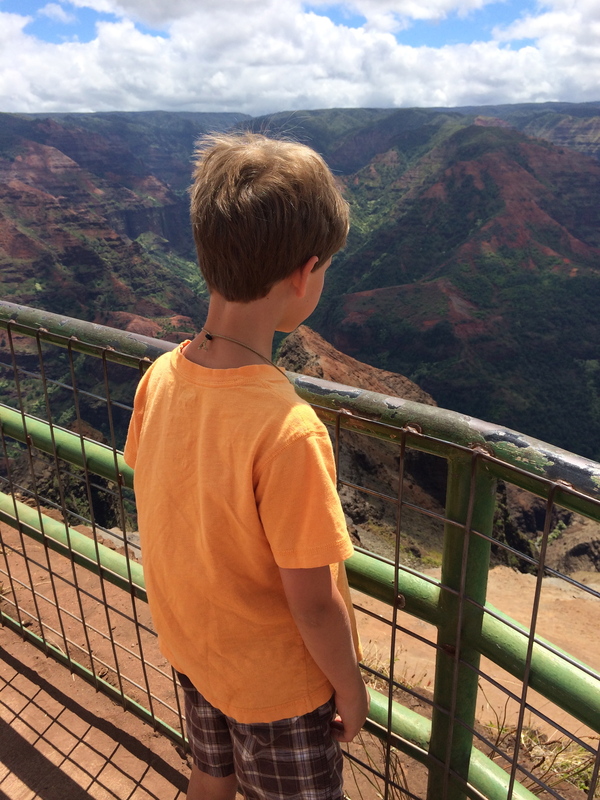 You can’t miss the Waimea Canyon, nicknamed the Grand Canyon of the Pacific. It’s truly magnificent! Watch the beginning of this video to get a taste. At the end of the road is Ke’e State Park. If you’re a hiker, you’ll be in paradise. As the crow flies the canyon and park are a very short distance from the north shore. Unfortunately, because of the wet and rugged terrain, it has been impossible to connect this road that runs the periphery of Kauai. If you are planning to visit from Princeville, it will take over two hours to get there. We stayed in Kapa’a for our final night and left our stuff at the hotel in order to visit this amazing canyon. There are lots of interesting places on the south side of the island but I cannot personally attest to them. If you find great options, drop me a line! If you’re looking for dining that meets your needs on vacation, check out the tips from my post: Finding Safe Food on Vacation: Seven Lessons Learned. A listing of Kauai farmers’ markets can be found here. We use several apps to gather relevant reviews for dining including Find Me Gluten Free, YoDish App, and AllergyEats. Please add reviews and make life easier for the rest of us! Please leave a comment if you have anything to add to this list. Happy Travels! Disclaimer: I cannot guarantee that the options listed will meet your needs. Please use this as a starting point to do your own research to ensure that your dining experience is safe for you or your family member. Thanks for posting. We will be traveling to Kauai and Maui in a few weeks with our daughter who is celiac and allergic to peanuts and tree nuts. I’m so glad it was helpful! If you have any feedback after your trip, please share! This is a great post! Keeping it bookmarked in case my husband & I ever make it to Hawaii!